Former NFL wide receiver/return man Jacoby Jones will officially announce his retirement later today, according to press release from the Ravens. Jones, 33, enjoyed a nine-year NFL tenure, but he’s perhaps best known for his efforts in the 2012-13 playoffs as a member of the Ravens. With fewer than 50 seconds remaining in Baltimore’s AFC divisional round matchup against Denver, Jones got behind Broncos safety Rahim Moore to haul in a 70-yard touchdown to tie the game. Following what became known as the “Mile High Miracle,” the Ravens defeated Denver in overtime, beat New England in the AFC Championship Game, and eventually won the Super Bowl over San Francisco. A third-round pick in 2007, Jones spent five seasons with the Texans before joining the Ravens from 2012-14. The Lane product finished up his career in 2015 by playing in five games with the Chargers and four contests with the Steelers. All told, Jones posted 203 receptions for 2,733 yards and 14 touchdowns, and added nine more scores in the return game. He earned first-team All-Pro honors in 2012 as a returner. PFR extends its best wishes to Jones in retirement. Wide receiver/return man Jacoby Jones has now been cut for the second time this season, as Steelers PR man Burt Lauten announced (via Twitter) that the club has waived the veteran. To fill Jones’ roster spot, Pittsburgh has promoted safety Ross Ventrone off its practice squad. The Steelers claimed Jones off waivers from the Chargers in early November, assuming the remainder of his $900K base salary. The 31-year-old was expected to provide a spark to Pittsburgh’s special teams unit, but he averaged just over three yards per return on punts and less than 25 yards per return on kickoffs. Notably, Jones botched two kicks in early December and hasnt’t seen any game action since those miscues. Jones was due a non-guaranteed 2016 base salary of $3MM, so the Steelers have now cleared that total off next year’s books. (It never appeared remotely likely that Pittsburgh would keep Jones on its roster for the 2016 season, as its waiver claim looked to be a move for 2015 only). Jones is no longer a factor in clubs’ offensive game plans, and now that he’s struggled even in his special teams duties, he could struggle to find a deal next spring. Ventrone, 29, is a career special-teamer with 22 career games to his name (including five this season with the Steelers). He’s bounced on and off Pittsburgh and New England’s practice squads this year, and he’ll look to provide some depth as the Steelers head into their regular season finale against the Browns. While Chip Kelly may not be considered the Eagles bona fide general manager, there’s no denying that he was controlling personnel decisions this offseason. Based on the team’s underwhelming performance in 2015, NFL Media’s Michael Robinson believes the organization needs a more traditional GM. “He needs a guy that’s going to come in and help him evaluate talent,” he said (via Conor Orr of NFL.com). The Bengals have denied both USC and Miami’s request to interview offensive coordinator Hue Jackson for their previous head coaching vacancies, reports Mike Florio of ProFootballTalk.com. If Jackson doesn’t receive an NFL offer, Florio believes he could eventually replace Marvin Lewis in Cincinnati. Firing Mike Pettine with four games to go makes little sense for the Browns, writes Marla Ridenour of Cleveland.com. The writer believes the move would “do more harm than good,” as owner Jimmy Haslam‘s “quick trigger” may make it hard to find a competent replacement. Steelers return man Jacoby Jones botched a pair of kicks in the first half of Sunday’s game against the Colts. The veteran has been benched for the second half, and Florio wonders if his tenure with Pittsburgh may be over. There are some big free agent decisions looming for the Packers, as Rob Reischel of the Journal-Sentinel writes. The Packers’ unrestricted free agents will include defensive end Mike Daniels, defensive tackles B.J. Raji and Letroy Guion, cornerback Casey Hayward, outside linebackers Mike Neal and Nick Perry, kicker Mason Crosby, wide receiver James Jones, fullback John Kuhn, and running back James Starks. Meanwhile, safety Chris Banjo, linebacker Andy Mulumba and guard Lane Taylor headline Green Bay’s list of restricted free agents. GM Ted Thompson has done a great job of keeping the team’s core together in recent years, but this year’s free agent class might test his abilities. Tom Brady isn’t the only star that wants to play for another decade, as Mike Florio of PFT writes. “If God’s willing, 10 more years,” Vikings running back Adrian Peterson said regarding the duration of his career. “If God’s willing, I’ll just be able to walk away from the game at the highest level whenever I decide.” For his career, AP has run for 10,823 total yards. He’s still 7,532 yards behind Emmitt Smith’s all-time career total. Ravens coach John Harbaugh wasn’t aware of Jacoby Jones‘ release until shortly after practice Wednesday, Jeff Zrebiec of The Baltimore Sun tweets. Harbaugh said that Jones’ availability will at least be discussed. On Tuesday, the Chargers parted ways with the one time Baltimore Super Bowl hero. The veteran returned five punts for a grand total of -4 yards for the Bolts, which clearly wasn’t what they had in mind when they gave him a two-year, $5.5MM deal in the spring. The Browns will start Johnny Manziel vs. the Bengals on Thursday night, Ian Rapoport of NFL.com tweets. 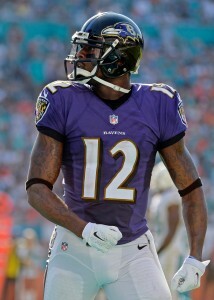 The Chargers released wide receiver/return man Jacoby Jones, according to Adam Schefter of ESPN.com (on Twitter). Jones, 31, signed a two-year, $5.5MM deal with the Bolts back in March. Jones will still collect a healthy $2.5MM portion of his deal. Through the midway point of the season, Jones did not come close to delivering on his free agent deal. The veteran has returned five punts for a grand total of -4 yards. On Sunday, he opted against a fair catch at the 19-yard line and watched a punt roll to the three. That could have been the straw that broke the camel’s back, though Jones has been pretty abysmal overall. The Chargers have just one punt return yard through eight games, second-worst in NFL history and worst since 1972, as Michael Gehlken of U-T San Diego notes. Wide receiver Javontee Herndon, recently promoted to the 53-man roster, seems like a candidate to take Jones’ place as punt returner. Devin McCourty, S (Patriots): Five years, $47.5MM base value. $15MM signing bonus. $28.5MM guaranteed (Twitter link via Aaron Wilson of the Baltimore Sun). Jacoby Jones, WR (Chargers): Two years, $5.5MM base value. $1.6K signing bonus (Twitter link via Pro Football Talk). Arthur Moats, OLB (Steelers): Three years, $7.5MM base value. $1.9MM signing bonus (Twitter link via Wilson). Ted Ginn Jr., WR (Panthers): Two years, $4.2MM base value. $1.7MM signing bonus. Up to $1.5MM in incentives (Twitter link via Tom Pelissero of USA Today). Derek Carrier, TE (49ers): Three years, $2.985MM base value. $400K signing bonus. About $1MM in escalators (Twitter link via Pelissero). 12:12pm: Jones’ two-year deal with San Diego can be worth up to $5.5MM, according to Ian Rapoport of NFL.com (via Twitter). 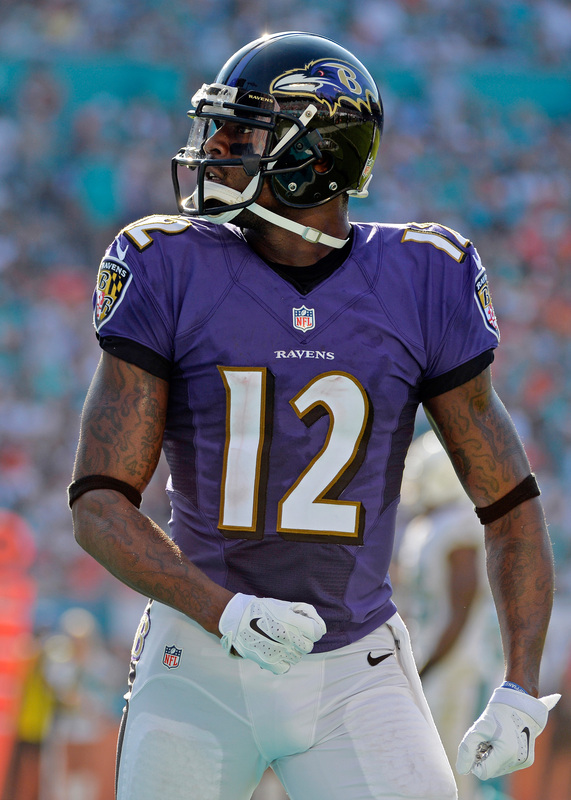 11:53am: After being cut by the Ravens, wide receiver and return man Jacoby Jones is heading to a team that his old club beat out for a playoff spot last season. According to Adam Schefter of ESPN.com (via Twitter), Jones has reached an agreement on a two-year deal with the Chargers. Jones, 30, returned kicks and punts for Baltimore in 2014, but his role on offense was significantly reduced — after being targeted 68 times and hauling in 37 passes in 2013, Jones received just 18 targets and caught nine passes in 2014. He also averaged 30.6 yards on 32 kickoff returns, and 9.2 yards on 30 punt returns. In San Diego, Jones will give the Chargers a dynamic presence on kick and punt returns that the team has lacked in recent years. In 2014, Eddie Royal and Keenan Allen split duties on punt returns, while Chris Davis was the team’s primary kick returner. Davis didn’t have a return longer than 35 yards, and the Chargers didn’t have a kick or punt return touchdown for the season. Prior to agreeing to terms with the Chargers, Jones also visited the Bengals and Titans. After visiting the Browns yesterday, wide receiver Brian Hartline headed to Chicago and is meeting with the Bears today, reports Mike Florio of Pro Football Talk. Hartline’s visit in Cleveland “went really well,” per Florio, who says the ex-Dolphin hopes to decide on his new team within the next 24 hours. While other teams have shown interest in Hartline, it seems likely that the Browns and Bears would be the frontrunners if he anticipates a quick decision. Safety Tyvon Branch, whose release was made official by the Raiders this week, will visit the Colts, a source tells Conor Orr of NFL.com (Twitter link). Orr’s report suggests that Branch’s meeting with Indianapolis will be the first of several visits for the free agent defensive back. There has been heavy interest thus far in ex-Eagles cornerback Cary Williams, with a dozen teams contacting his agent since he was cut by Philadelphia, tweets Aaron Wilson of the Baltimore Sun. Williams, who is believed to have interest in a reunion with the Ravens, has also drawn interest from the Titans, who “kicked the tires” on the free agent corner, according to Jim Wyatt of the Tennessean (via Twitter). Jacoby Jones‘ next visit will be to San Diego to meet with the Chargers, a source tells Josina Anderson of ESPN.com (Twitter link). The veteran receiver and return man previously made trips to talk to the Bengals and the Titans. Lyons Yellin of WWL-TV in New Orleans tweets that he has heard rumblings about the Eagles being interested in Mark Ingram. With the club poised to send starting running back LeSean McCoy to Buffalo, its reported interest in Ingram certainly makes a little more sense.